PhotoStitcher portable will automatically combine overlapping photos to produce perfect panoramic image. Go to our Tutorials page and see for yourself how easy it is for anyone to do with just a few simple steps. Making a really nice panoramic photo of a city usually requires a wide-angle camera. Typical non-professional lenses simply cannot capture the entire view in one frame. However if you aren’t a lucky owner of a professional camera and photographic skills you still can create perfect panoramas from scattered images of the same place. 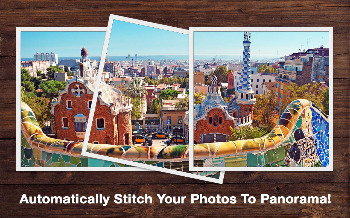 PhotoStitcher automatically aligns individual pictures stitching them one by one into an eye-catching professionally-looking panorama!